Goalkeeper Bruno Fernandes, who was sent to prison for killing his ex-girlfriend and feeding her to his dogs, has signed for Brazilian second division club Boa Esporte. Fernandes, known in Brazil as Bruno, was sentenced to 22 years in prison for the 2010 murder of Eliza Samudio. The former Flamengo player was released last month on a legal technicality. "I am very happy for the opportunity I have been given," said Bruno at a news conference. The signing has been widely condemned in Brazil, and has sparked protests from fans and the withdrawal of several Boa Esporte sponsors. Both Boa Esporte's main sponsor, Gois and Silva Group, and kit maker Kanxa have removed themselves from association with the club as a result. At his news conference, Bruno, who has been released pending an appeal, refused to answer questions about the murder of Ms Samudio, his former partner and mother of his child. Although Ms Samudio was never found, Bruno's cousin told the court her body had been fed to dogs. Prosecutors said she was killed after demanding that Bruno pay child maintenance for their baby son. At his trial, the footballer admitted to knowing that Ms Samudio had been strangled and her remains fed to dogs, but denied ordering the killing. "I want to help Boa Esporte to get to the first division," Bruno said after joining his new club. "I thought several times that I wouldn't make it. But I can't throw in the towel, my wife wouldn't accept it. I have to believe in me." 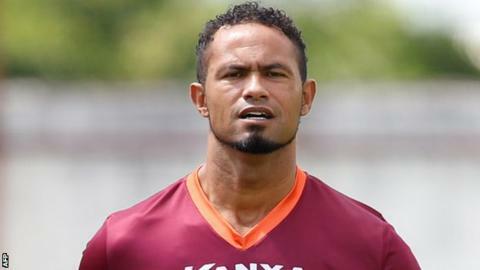 The 32-year-old added he had been made "very welcome" in Varginha, the city where the club is based. He said: "People demand a lot of me for what happened in the past. Boa Esporte is opening the doors for me." He has also said he did not rule out making Brazil's national team, having once been tipped as a likely starter for the 2014 World Cup. "One should always keep dreaming. One day I dreamed of making my comeback and I am now living this moment."